In April we were in the Midwest’s largest city with the look at the site of a NCAA men’s basketball tournament, and for the April Pléiades 1 – SPOT 6/7 Stadium of the Month we travel east with a stop in the nation’s largest city and the site of an early season Major League Baseball tilt between the Yankees and the Red Sox, i.e. Yankee Stadium. 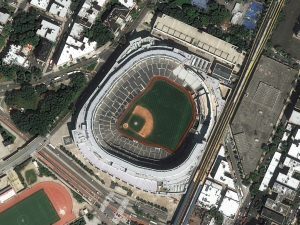 A 50-cm color image of Yankee Stadium in Bronx, New York, USA collected on August 23, 2018 by Pléiades 1B; and then a 1.5-m SPOT 7 image of the same stadium collected on July 7, 2018. These images have custom processing and color balancing applied by Apollo Mapping. PLEIADES © CNES 2019, Distribution Airbus DS. SPOT © Airbus DS 2019. About the Venue: Located in the Bronx, New York, Yankee Stadium is truly one of the iconic sports ‘palaces’ in all of the world. Land for the original Yankee Stadium was built early in 1921 and just two years later, the stadium was ready for its April 18, 1923 opening day game against (of course) the Boston Red Sox. After many decades and millions of fans, it was time to replace the original Yankee Stadium with a new $1.6 billion project located kitty-corner to the original structure. Work on the new 47,422-seat Yankee Stadium commenced on August 16, 2006 with its opening day on April 16, 2009 against the Cleveland Indians. After nearly a decade in service, it was time to improve the new Yankee Stadium in 2017 which included many new roof decks and bars. Fun Factoids: (1) There might be no better rivalry in baseball (perhaps even in sports) than the Yankees-Red Sox rivalry – and this is even coming from an Orioles fan! On April 16th and 17th, this series starts fresh again for 2019 with tickets for the 16th already topping $3000 per seat! 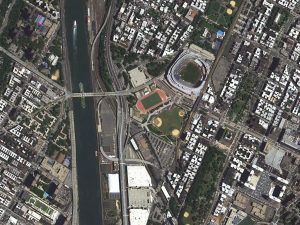 (2) Before purchasing land in the Bronx, the original Yankee Stadium almost ended up in Manhattan between 136th and 138th on the upper west side of the island. (3) According to a 1957 news article, the largest attendance in the history of Yankee Stadium could have been on May 15th when televangelist Billy Graham drew over 100,000 fanatics. This entry was posted in The Geospatial Times and tagged Pleiades 1, Pléiades 1 Stadium of the Month, Satellite Constellation, SPOT, The Geospatial Times, Tips & Tech by Apollo Mapping. Bookmark the permalink.